Brazil: The Father of Capoeira—or the Mother? Despite the title, this post is not exactly about how capoeira originated. It’s about something I heard recently, and wanted to…question? Correct? Mostly because I didn’t say anything at the time I heard it, and slightly kind of regret it now; so I’m saying it here! I was at an event when a mestre (well, okay, my mestre) started talking about capoeira, and partway through he said, “Africa is the mother of capoeira…and Brazil is the father.” At this point there was a rippling of “oohhhhs” and laughter among the students, and a self-satisfied pause at his own joke. But I just wondered…why was that funny/how was it a joke? I thought making the comparison was fine (though inaccurate, as I’ll discuss shortly), but were people laughing because of the idea that Brazil “overpowered” Africa, or seized its flower of capoeira, or something? Because in that case, it really wouldn’t have been funny at all. As for the comparison itself, first I thought it was fine (without the supposed-to-be-funny part), but thinking upon it further, I realized it was actually wrong. Assuming that the way, way-back roots of capoeira are from Africa (safe general statement #1) and that the actual sport/art as we know it today came to flourish in Brazil (safe general statement #2), then…Africa is actually the father of capoeira, and Brazil is the mother. Why? Think about it. (Note: This is going to be all based on stereotypes…since that’s how metaphors work.) Africa provided the seed of capoeira, but it was the environment in Brazil that nourished and raised capoeira (even if at one point Brazil actually tried to abort it, but you get what I mean…though even in that respect, to whom do abortions usually apply?). The genes and chromosomes of capoeira came from both Africa and Brazil, but it was inside Brazil where they actually combined and merged and grew into the fully-formed art of capoeira (or as fully-formed as a constantly changing and evolving art can get). 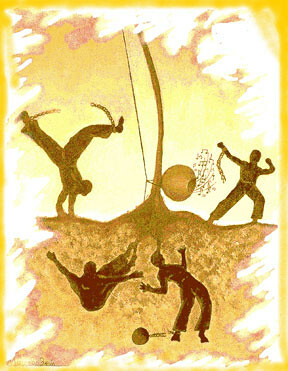 The gestation period of capoeira took place in Brazil—that is, Brazil was the womb. And who has those? So, with all due respect to the mestre…if one insists on making this particular comparison, it’d be more accurate to say that Africa was the father of capoeira, and Brazil the mother. Not the other way around. And that doesn’t mean Brazil is weaker than or has been subjugated by Africa. Just my two cents! Glad you came by my blog. I just noticed that you now have clean URLs too 😉 I’m glad my post was of help! Just a thought… I wonder if the “Africa = mother” thing came from a misapplication of Pastinha’s famous statement that begins Angola, capoeira mae… in which he calls capoeira angola the “mother capoeira,” the one that gave birth to the other styles, so to speak. Plus, Africa is commonly referred to as the “motherland” – the birthplace and womb of humanity, for one thing, and also the origin of the many and varied African cultural traditions found throughout the diaspora. So I kind of suspect that it was these associations, rather than gender roles/stereotypes, that led him to define Africa as the mother and then Brazil by default as the other parent… I wouldn’t read into it any more than that.